فدایی تهرانی, سبیحه, رئیسی, افراسیاب, قاسمی, بهزاد. (1395). مطالعه عددی جابجایی اجباری جریان آرام نانوسیال در یک کانال موازی همراه با منابع حرارتی گسسته. نشریه پژوهشی مهندسی مکانیک ایران, 18(4), 29-54. سبیحه فدایی تهرانی; افراسیاب رئیسی; بهزاد قاسمی. "مطالعه عددی جابجایی اجباری جریان آرام نانوسیال در یک کانال موازی همراه با منابع حرارتی گسسته". نشریه پژوهشی مهندسی مکانیک ایران, 18, 4, 1395, 29-54. فدایی تهرانی, سبیحه, رئیسی, افراسیاب, قاسمی, بهزاد. (1395). 'مطالعه عددی جابجایی اجباری جریان آرام نانوسیال در یک کانال موازی همراه با منابع حرارتی گسسته', نشریه پژوهشی مهندسی مکانیک ایران, 18(4), pp. 29-54. فدایی تهرانی, سبیحه, رئیسی, افراسیاب, قاسمی, بهزاد. مطالعه عددی جابجایی اجباری جریان آرام نانوسیال در یک کانال موازی همراه با منابع حرارتی گسسته. نشریه پژوهشی مهندسی مکانیک ایران, 1395; 18(4): 29-54. در این پژوهش، انتقال حرارت جابجایی اجباری جریان آرام نانوسیال آب - مس درون کانال با صفحات موازی با منابع حرارتی دما ثابت، به صورت عددی بررسی شده است. هدف، بررسی عددی تأثیر عدد رینولدز، درصد حجمی نانوذرات و تعداد منابع حرارتی روی میدان جریان و نرخ انتقال حرارت می‌باشد. معادلات حاکم به روش حجم کنترل جبری شده و توسط الگوریتم سیمپل به طور هم‌زمان حل شدند. نتایج نشان می‌دهند که افزایش درصد حجمی نانوذرات و افزایش عدد رینولدز، هم‌چنین تقسیم یک منبع حرارتی به قسمت‌های کوچکتر و توزیع آنها، نرخ انتقال حرارت را افزایش می‌دهند. Santra, A.K., Sen, S., and Chakraborty, N., “Study of Heat Transfer Due to Laminar Flow of Copper/Water Nanoﬂuid Through Two Isothermally Heated Parallel Plates”, International Journal of Thermal Sciences, Vol. 48, pp. 391-400, (2009). Zeinali Heris, S., Nassan, T.H., Noie, S.H., and Sardarabadi, M., “Laminar Convective Heat Transfer of /Water Nanoﬂuid Through Square Cross-cectional Duct”, International Journal of Heat and Fluid Flow, Vol. 44, No. 4, pp. 375–382, (2013). Tahir, Sh., and Mital, M., “Numerical Investingation of Laminar Nanoﬂuid Developing Flow and Heat Transfer in a Circular Channel”, Applied Thermal Engineering, Vol. 39, No. 9, pp. 8-12, (2012). Akbarinia, A., and Behzadmehr, A., “Numerical Study of Laminar Mixed Convection of a Nanoﬂuid in Horizontal Curved Tubes”, Applied Thermal Engineering,Vol. 27, pp. 1327-1337,(2007). Mirmasoumi, S., and Behzadmehr, A., “Numerical Study of Laminar Mixed Convection of a Nanoﬂuid in a Horizontal Tube using Two-phase Mixture Model”, Applied Thermal Engineering, Vol. 28, pp. 717-727, (2008). Dehshiri-Parizi, A., and Salimpour, M.R., “Water/Nanofluid Flow Heat Transfer and Pressure Drop Through Ducts with Circular, Square and Rectangular Cross-sections”, Modares Mechanical Engineering, Vol. 15, No. 5, pp. 377-382, (2015). Feng, Z.Z., and Li, W., “Laminar Mixed Convection of Large-Prandtl-Number in Tube Nanoﬂuid Flow, Part I: Experimental Study”, International Journal of Heat and Mass Transfer, Vol. 65, pp. 919-927, (2013). Akbari, M., Behzadmehr, A., and Shahraki, F., “Fully Developed Mixed Convection in Horizontal and Inclined Tubes with Uniform Heat Flux using Nanoﬂuid”, International Journal of Heat and Fluid Flow, Vol. 29, pp. 545-556, (2008). Hosseinipour, E., Zeinali Heris, S., and Shanbedi, M., “Experimental Investigation of Heat Transfer Coefficient and Pressure Drop of Carbon Nanotubes-water Nanofluid under Constant Heat Flux”, Modares Mechanical Engineering, Vol. 14, No. 13, pp. 19-26, (2014). Fakour, M., Vahabzadeh, A., and Ganji, D.D., “Scrutiny of Mixed Convection Flow of a Nanofluid in a Vertical Channel, Modeling of Microscale Transport in Multiphase Systems”, Case Studies in Thermal Engineering, Vol. 4, pp. 15-23, (2014). Mansour, R.B., Galanis, N., and Nguyen, C.T., “Experimental Study of Mixed Convection with Water/Nanoﬂuid in Inclined Tube with Uniform Wall Heat Flux”, International Journal of Thermal Sciences, Vol. 50, pp. 403-410, (2011). Alvarino, P.F., SaizJabardo, J.M., Arce, A., and Lamas Galdo, M.I., “A Numerical Investigation of Laminar Flow of a Water/Alumina Nanoﬂuid”, International Journal of Heat and Mass Transfer, Vol. 59, pp. 423-432, (2013). 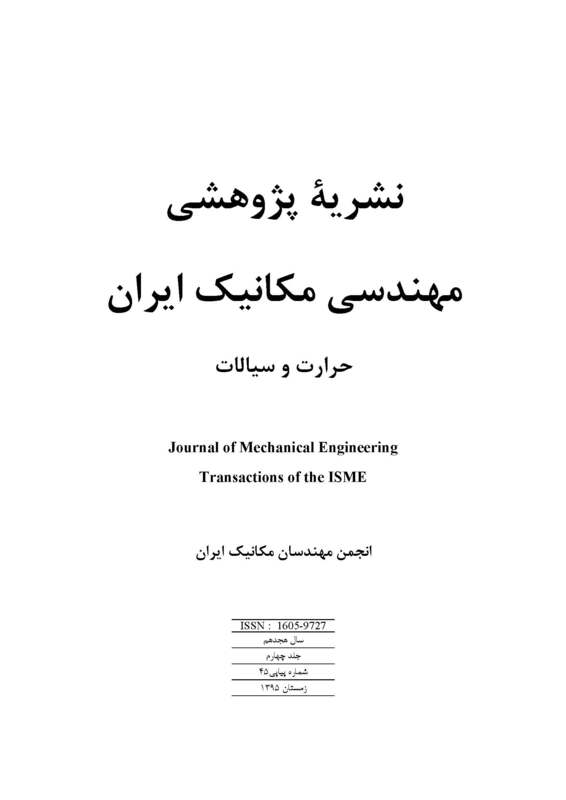 Salimi Gachuiee, M., Peyghambarzadeh, S.M., and Hashemabadi, S.H., “Experimental Investigation of Convective Heat Transfer of /Water”, Modares Mechanical Engineering, Vol. 15, No. 2, pp. 270-280, (2015). Malvandi, A., and Ganji, D.D., “Effects of Nanoparticle Migration on Force Convection of Alumina/Water Nanoﬂuid in a Cooled Parallel-plate Channel”,Advanced Powder Technology, Vol. 84, pp. 196-206, (2014). Kalteh, M., Abbassi, A., Saffar-Avval, M., Frijns, A., Darhuber, A., and Harting, J., “Experimental and Numerical Investigation of Nanoﬂuid Forced Convection Inside a Wide Microchannel Heat Sink”, Applied Thermal Engineering, Vol. 36, pp. 260-268, (2012). Ahmed, M., and Eslamian, M., “Laminar Forced Convection of a Nanofluid in a Microchannel: Effect of Flow Inertia and External Forces on Heat Transfer and Fluid Flow Characteristics”, Applied Thermal Engineering,Vol. 78, pp. 326-338, (2015). Brinkman, H.C., “The Viscosity of Concentrated Suspension and Solution”, International Journal Chemical Physics, Vol. 20, No. 4, pp. 571-581, (1952). Abu-Nada, E., Masoud, Z., and Hijazi, A., “Natural Convection Heat Transfer Enhancement in Horizontal Concentric Annuli using Nanofluids”, Int. Comm. in Heat and Mass Transfer, Vol. 35, No. 5, pp. 657-665, (2008). Corcione, M., “Empirical Correlating Equations for Predicting the Effective Thermal Conductivity and Dynamic Viscosity of Nanofluids”, Energy Convers. Manag, Vol. 52, pp. 789-793, (2011). Patankar, S.V., Numerical Heat Transfer and Fluid Flow, Hemisphere, Washington, D.C, (1980). Zeinali Heris, S., Etemad, S.Gh., and Nasr Esfahany, M., “Experimental Investigation of Oxide Nanofluids Laminar Flow Convective Heat Transfer”, Int. Comm. in Heat and MassTransfer, Vol.33, pp. 529-535, (2006).